When it comes to mounting your scope, you definitely need the best scope rings. 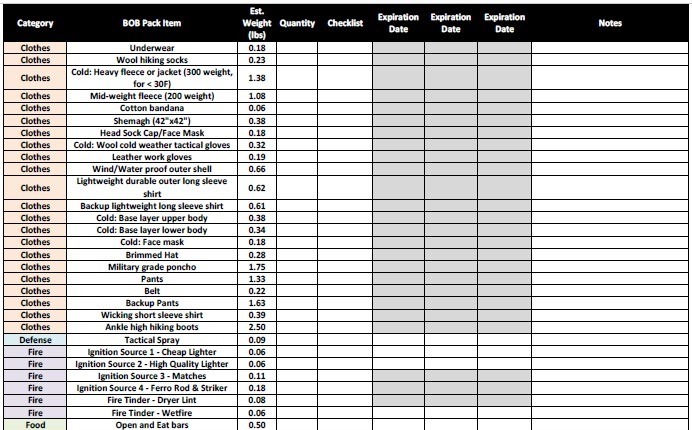 From tube size to height profile, you need to know what you are buying. A lot of thought goes into buying optics for your firearm. Most of that thought goes into the scope itself, but the scope rings are just as important. 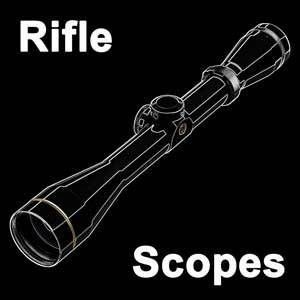 Your rifle is only going to be as accurate and stable as the scope rings allow. What most people do is price their rings in relation to the price of their scope. However, you always want to get the best quality for what you pay. In this article, we look at the top 10 scope rings available today and discuss the features that landed them on this list. By the end, you should have no problem picking out a set of rings that you can be confident in to mount your scope. The majority of scopes are available in either 1-inch or 30-millimeter (mm) tube diameter options. It is important that you purchase the correct size scope rings to match your scope. Rings that are too small will dent and possibly crush your scope tube. Rings that are too large will not hold your scope in place and will be wildly inaccurate shooting. You do not want your scope to be in contact with the rifle, especially the objective lens. Scope rings come in several different heights labeled as profiles. If you have a huge 50-millimeter objective lens scope, you need high profile scope rings to put some space between the scope bells and rifle. If you have a smaller diameter objective lens, you might want a low profile scope ring. Keeping your scope closer to the rifle improves consistent shooting. Additionally, some scope rings offer a see through feature, which allows you to utilize the iron sights on your rifle. If you are using a high-power magnification scope, but might come up on deer or other game at close range, you might want the see-through feature. You will find that most scope rings are available in a two-piece individual ring set or two rings that are mounted to a single base. The two-piece version gives you a little more flexibility in ring placement on your scope. The single piece adds a little more durability. 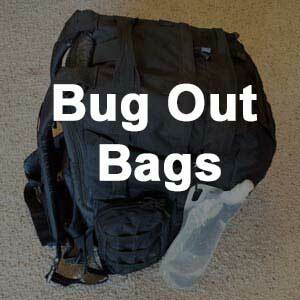 This a personal preference, but one you should consider. 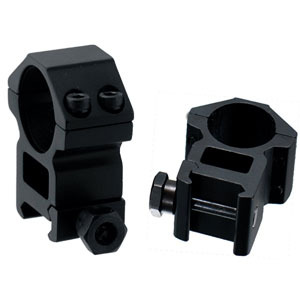 Not all scope rings are designed and built to fit every type of scope and mounting bracket. 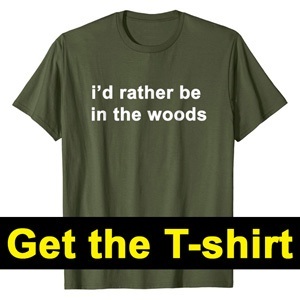 While this would make life much easier, that is not the case! Be aware of your rifle’s mount type. Whether its Weaver, Picatinny, or dovetail, be sure that the rings you are interested in will fit these mounting specifications. 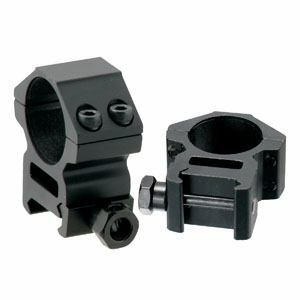 If you prefer certain scope rings, you can buy adapters to fit the rings onto your rifle mounts. 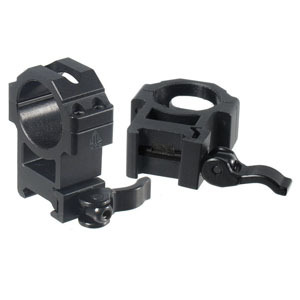 This ring set will fit any weaver style mount as well as a picatinny rail system. 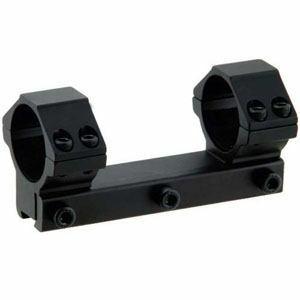 They are a medium height profile design that will fit any one-inch tube scope. 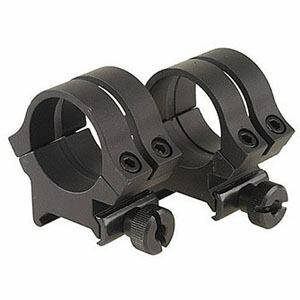 This scope ring features a see-through capability that allows you to utilize the firearms iron sights. 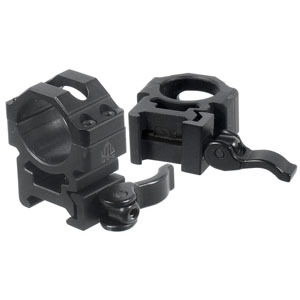 Each scope ring securely attaches to the scope with four easily adjustable hex rings. These rings are made from aircraft grade aluminum alloy and have a black matte finish. They are super sturdy and easy to install. 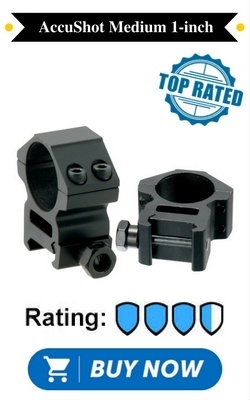 If you are looking for some cheap, great quality rings for a low to mid price range scope, these are definitely a top winner.​ They are by far the best scope rings for the money. If you need a high profile, then check out these rings that are similar to our top winner above. They also utilize a see-through design and are for 1 inch scope tubes. This ring design can be mounted to any Picatinny or Weaver style scope mounts as well. They feature a full-length locking plate that provides a secure and tight fit for the scope. These rings are made from high-grade aluminum alloy and come in a black matte finish. They are perfect for use with a large diameter objective lens scope and will provide the needed space between your scope and rifle. The Nikon P-series are strong, lightweight scope rings that fit any 1-inch scope tube. They can be mounted to any flattop Picatinny rail system. This reversible two-piece ring set provides mounting versatility. They also allow you to properly set any scopes eye relief and forward positioning easily. 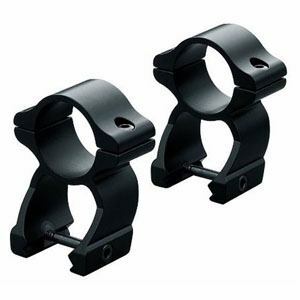 These are great for high magnification to compact scopes, making them the best rifle scope rings. These rings feature a large base for added rigidity while still giving you the versatility of two ring scope sets. If you are getting them for your AR-15, check to make sure that they will fit well with your configuration before you buy them. 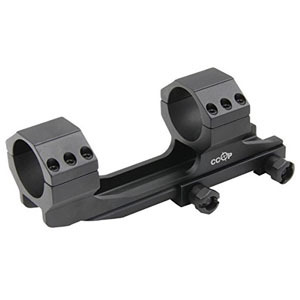 CCOP offers a single piece high profile scope ring setup designed to fit any 30-millimeter scope tube. The rings and base are crafted from T6061 high-grade aluminum alloy and have a rugged design built for high use with high caliber weapons. Each ring uses six hex screws for a solid lock around the scope. The base attaches via two locking pins that will fit with any Picatinny rail design. These rings provide visibility between the rings and base and allows use of the iron sights, making it the best 30mm scope rings. 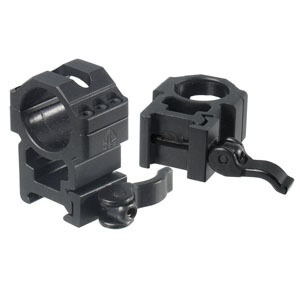 UTG offers a high profile, two-scope ring model that will work with any one-inch scope tube. Each ring locks into place around the scope with six screws. 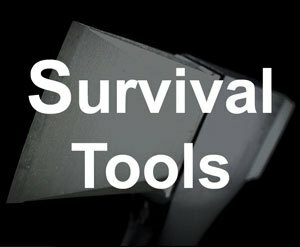 They are machined from aircraft grade aluminum alloy and are anodized for extra strength and scratching resistance. These rings are guaranteed to hold your scope in place and never need to re-zero. These rings also utilize a quick attaching/locking lever at the base of the rings for easy adjustment and removal. The interior of the rings that comes into contact with the scope is covered in a synthetic protective tape that will not scratch the scope tube. These rings can be mounted to any Picatinny rail system. UTG also offers a medium profile version of this scope ring design. 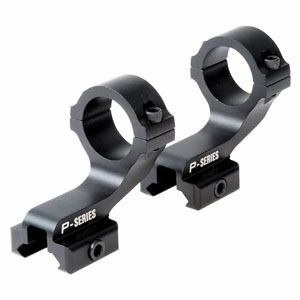 Like the high-profile model, these scope rings are made from quality aluminum alloy and are guaranteed to hold the rifle in perfect position over extended use. They make use of a lever mount lock. The scope is mounted into the rings and is secured with four locking screws per ring. The rings can be mounted to any Picatinny railing. The interior of these rings also utilizes a protective tape that provides extra grip between the scope and rings. The Med Pro scope rings have an open design allowing the use of your stock sights. They are definitely the best quick detach scope rings for most users. These scope rings from Leupold are machined from aircraft grade aluminum in a black matte finish and are extremely rugged and lightweight. This two-piece scope ring set is high profile and is great for large objective lens scopes with one-inch tubes. They also allow the use of iron sights. The scope is locked into the rings with two hex screws for each ring. These rings can be mounted to any weaver style rails. Leupold, known for their optics, produce equally impressive scope rings. 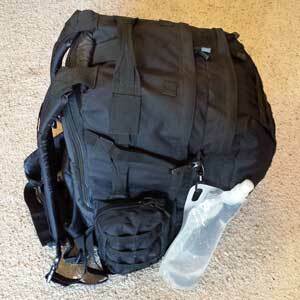 They provide stability for your scope for years of use. This is another one-piece scope ring design that can be mounted to 3/8-inch dovetail railing and will hold any scope with one-inch tubes. The 100-millimeter base length provides fantastic stability to your scope. The scope is secured in the rings with four hex screws per ring. Synthetic tape on the interior keeps the scope secure without damaging the tube. This scope ring setup does not have any see through features and is low profile. These scope rings are similar to the previous UTG scope rings. 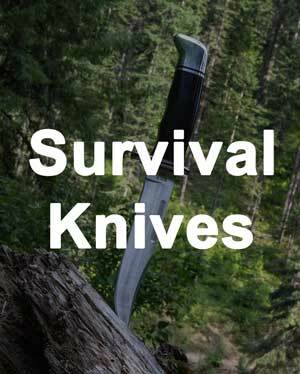 They feature a two-piece design and are machined from high-grade aluminum alloy with a black anodized finish. The rings use a quick detach/adjustment lever at the base. They are able to mount to any Picatinny rail. These rings use a taped interior that provides extra security to the scope tube. In case you need to use the iron sights, the see-through feature of these rings will allow their use. Unlike the previous models, this model holds 30 millimeter scope tubes and provides enough clearance to fit any size objective lens. Weaver's Quad Lock Scope rings are a two-piece design and can lock in with any one-inch scope tubes. These rings are machined from lightweight aluminum and sit low on the rail. If you need iron sight use, these rings will not be your first choice. These rings use a unique dual locking mechanism per piece giving you four locking rings total for incredible scope security and stability. These rings also use an easy to adjust thumb screws for rail mounting making the process much easier to mount and adjust. These rings are available in several finishes including matte black, gloss black, or silver. They can be mounted to any Weaver or Picatinny style rails. Scope rings are often overlooked when mounting optics to your firearm even though they are critical for a secure scope mount and consistently accurate shooting. The main things you want to look for is the scope tube diameter, ring height profile, and also the type of mounting system the rings work with. You can look into other factors too including whether you want fixed or detachable rings as well. 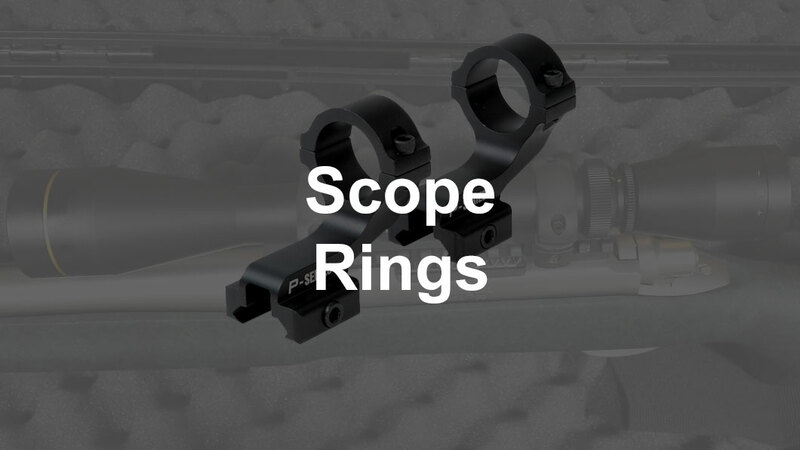 We hope this article has provided a brief, but clear guide to purchasing scope rings. If you choose ones on this list that meet your requirements, you should be good to go. If you haven't selected your scope yet, be sure to check out our guide so that you can get a refresh on all of the different factors that you should be aware of.